The Department of Primary Industries and the NSW Farmers’ Association are encouraging farmers to come to an exciting field day showcasing the 2007 Young Farmer of the Year winners Stuart and Alex Blake. Minister for Primary Industries Ian Macdonald said the event will be held on the Blake’s property “Winterbourne”, near Walcha in northern NSW. “To have a young family embracing some of the cutting edge technologies at the same time as embracing sustainable and environmentally friendly programs and is a great example of modern farming,” Minister Macdonald said. NSW Farmers’ Association President Jock Laurie says the Blake’s mixed livestock and cropping enterprise should be of interest to many. “Stuart and Alex specialise in the running of an artificial breeding service, Ewetec for sheep and Millbank Genetic Services for cattle, and they also demonstrate some wonderfully innovative sustainability programs,” Mr Laurie said. “During the day, they will show how they use embryo transfer technology, as well as give a tour and explanation of their pasture management and grazing systems and bush regeneration programs,” he said. “In this way, they will really show how they are embracing technology, innovation and conservation at the same time,” he said. Minister Macdonald says the Blake’s enterprise is a wonderful example of what the Young Farmer of the Year award aims to reward. “Jointly coordinated by industry and government through the efforts of the NSW Farmers’ Association and Department of Primary Industries, the awards are designed to recognise the outstanding efforts of our farmers across the state,” he said. “This field day will carry on that recognition by acknowledging what we can learn from our 2007 winners. The day will be a fantastic one for all,” Minister Macdonald concluded. The field day will be held on Friday 16 May 2008 at the Blake’s property “Winterbourne” near Walcha. To RSVP contact the NSW Farmers’ Association on 1300 794 000. Stuart Blake manages a mixed livestock and cropping enterprise near Walcha, together with wife Alex, his brother and his wife, and his parents. Sheep and cattle are rotationally grazed, promoting continual groundcover that also helps make the most of available water. 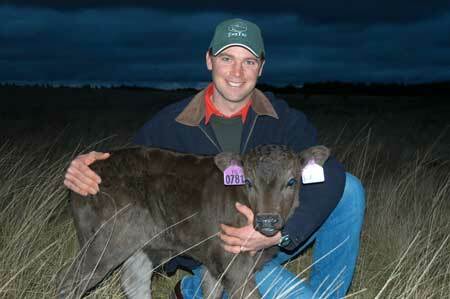 Stuart specialises in the running of an artificial breeding service, which he initially set up with his cousin Scott. Ewetec for sheep and Millbank Genetic Services for cattle today services a broad range of clients from throughout Australia, as well as a number of international clients. Embryos are collected from donors, then transferred either fresh or frozen to the Blake’s recipient animals. Stuart then either delivers pregnant recipients to the client’s or the resulting genetically valuable progeny at an agreed weight for age. Stuart is also involved in a partnership that has used genetics and embryo transfer expertise to produce the world’s finest bale of paddock grown wool. Stuart has gained experience internationally and exchanges the latest innovative ideas with industry colleagues. Drought management strategies including cell grazing, opportunity feedlots and tree plantings have helped Stuart and his family remain environmentally sustainable. Stuart’s community involvement includes Landcare, local shows, the local fire brigade and other industry networks. He believes young farmers need to be encouraged to ‘think outside the square’ and make the most of available opportunities.